Baby Bok Choy Salad with Ginger Sesame Soy Dressing – this hearty salad is packed with crunchy veggies, nuts, shredded chicken & chow mein noodles. I am so excited to share this amazing salad recipe with you today. I know, I know! You’re probably thinking it’s really difficult to get excited about bok choy salad. Before this salad, I was right there with you. But not any more, my friends. Not any more. The last co-op distribution I received 2 baskets, including 8 (yes, 8!) heads of baby bok choy. Score! There was ZERO sadness on my part because I knew exactly how I would be using these awesome veggies. Hello Baby Bok Choy Salad! Sadly, I am down to the last bowlful of Bok Choy Salad. Yes, 8 heads of baby bok choy gone (GONE!) in less than 2 weeks. I wasn’t bluffing when I told you this salad was amazing! The last little bowl is safely tucked away (hidden, if I’m being honest) in the back of the frig. Hopefully I’ll get to it before The Girl discovers it. She loves this salad as much as I do. 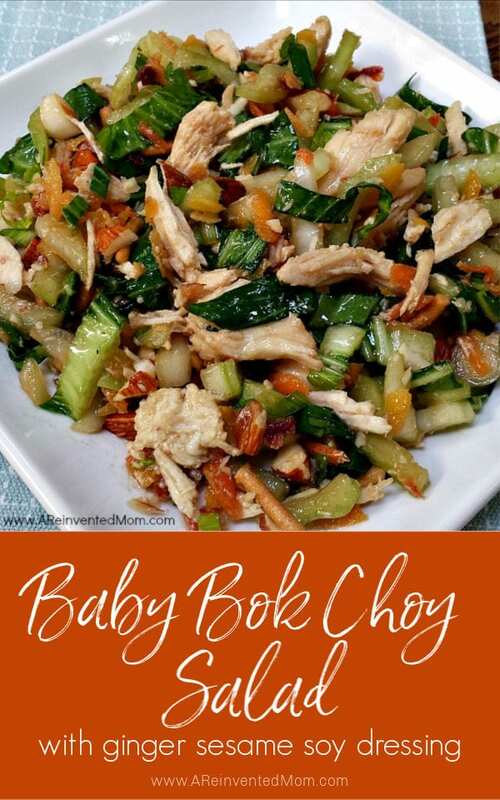 What The Heck Is Bok Choy And Where Can I Find It? Depending on where you live, you may know this hearty veggie as pak choy. Bok choy is a type of Chinese cabbage, consisting of edible, leafy green tops and a crunchy base. It can be eaten raw or cooked. Available in two sizes – baby and regular. Regular bok choy has dark green leaves with white stems. The baby version is smaller in size and has lighter green leaves. 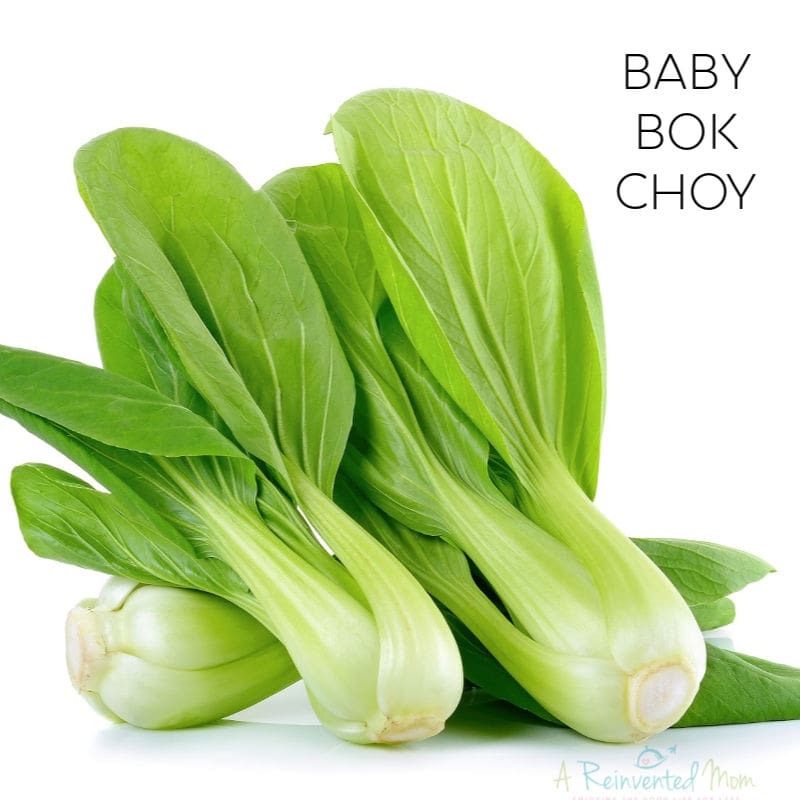 I prefer to use baby bok choy when it’s available, but you can use either type interchangeably. 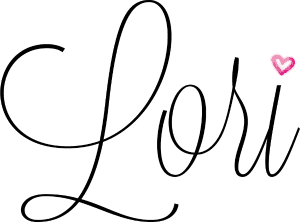 Most grocery stores carry bok choy in the produce aisles, near the leafy greens. Even my rural market stocks it regularly. 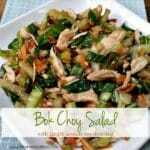 What Makes Baby Bok Choy Salad Sooo Good? The combination of baby bok choy, carrots and green onion make for a decent salad on it’s own. But all that changes when you toss in the crunchy almonds and chow mein noodles. The crunch factor is off the charts! As if the salad isn’t amazing enough already, the Ginger Sesame Soy Dressing steps up to the party with a combination of savory, tangy Asian flavors. Get ready for a flavor bomb of deliciousness! I love a versatile salad recipe and this one doesn’t disappoint. It’s delicious as a side dish with grilled meats (or any dinner for that matter!). Add shredded chicken and you have a hearty main dish. Serve with warm bread and fruit to round out the meal. This is also a great salad for BBQ’s and potluck parties because the greens hold up very well, even after dressing the salad. You can have this easy, healthy dinner on the table in 15 minutes. Less time than it takes to make a trip through the drive thru! 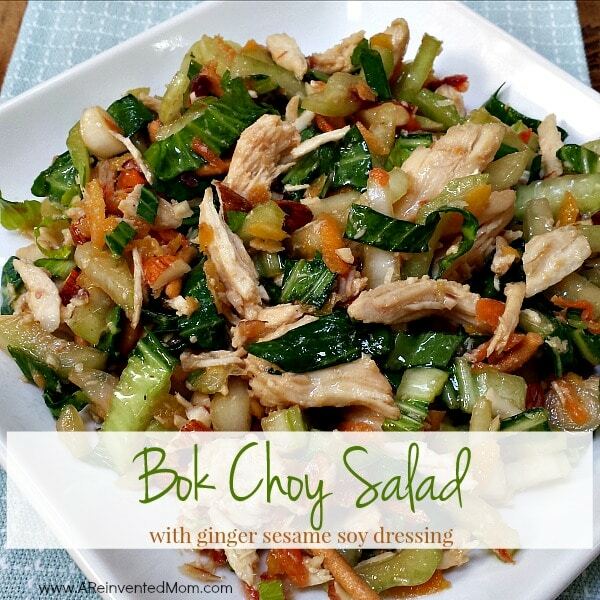 Baby Bok Choy Salad with Ginger Sesame Soy Dressing is destined to become a family favorite. This recipe was originally published on 6/17/15 and updated on 1/19/19. Baby Bok Choy Salad with Ginger Sesame Soy Dressing - this hearty salad is packed with crunchy veggies, shredded chicken & chow mein noodles. Serve as a side dish or with shredded chicken for a hearty main dish. Combine all dressing ingredients except for the 1/2 cup oil in a jar or bowl. Give it a quick stir to mix. While whisking or blending, slowly add the oil to the vinegar mixture and mix until blended. An immersion blender works well for making homemade salad dressings. Place all salad ingredients in a large bowl. Add desired amount of dressing and toss to combine. If you have picky eaters, serve this salad as a "Make Your Own" meal. Place each salad ingredient in a separate bowl and allow your people to make their own salad. Omit the chicken if you prefer to serve as a side dish. To prepare in advance - combine bok choy, carrots & green onions and refrigerate until ready to serve. Add the chicken, almonds, chow mein noodles and dressing prior to serving. This recipe looks so delicious! I’m never sure what to do with bok choy so I don’t buy it. I need to give this recipe a try for sure though. Thanks for sharing the recipe with us at MPM. You should definitely give bok choy a try, Julia. It’s got an amazing crunch and I think it’s more filling than other greens. Is the bok choy cooked? The bok choy is raw. Thanks for stopping by Polly! Yum! This salad look amazing, and I love making my own salad dressings! Definitely trying this one! Pinning, thanks for sharing! I think I could eat this salad every day. Thanks for stopping by, Jody!